Seven new temporary artworks have been installed along the Central Waterfront for the project Art Interruptions. Last week, five artists installed temporary art installations or began performance artworks along Greenwood Avenue North from North 67th to North 87th streets. All artworks will be up for approximately six weeks. Art Interruptions incorporates art on city sidewalks and in parks to offer a brief interruption in the day with a moment of surprise, beauty or humor. Administered in partnership with Seattle Department of Transportation (SDOT) and Seattle Parks and Recreation, Art Interruptions is funded by SDOT 1% for Art funds and administered by the Office of Arts & Cultural Affairs. Take a stroll along the waterfront on Alaskan Way between Marion and Wall streets and find the following artworks. Peter Bjordahl created a series of 20 to 30 handmade bricks, each with a USB interface protruding from the surface. Stacked together and arranged on Pier 62/63 the piece will appear as a collection of overly bulky and heavy USB memory sticks. Passersby can plug into the bricks or take them home to realize they are fully functioning memory sticks. Mary Iverson created an animated mural on the Marion Street pedestrian bridge near Seattle ferry terminal. It will consist of 29 illustrated panels that describe a story of a container coming off a cargo ship at port. Jennifer and Allan Kempson created a series of birdhouses out of wood, metal, paint, found materials and mini-LED-display scroll signs. They will mount them on light poles along the Pike Place hill climb adjacent to the Central Waterfront. Entitled “tweethouse,” the work will capture the experience of urban wildlife in creating birdhouses that provide a network of homes for urban birds. The artwork will double as a continuous feed of information to people on the web through Twitter, and on the street through digital signage that relays the Twitter feed. Twitter handle is @mktmockingbird. Ingrid Lahti created a site-specific, hanging installation created by the positions of moving, reflective mirrors attached to a framework at Waterfront Park on the west side of Elliot Way. The design was inspired by images of galaxies taken by the Hubble telescope and the ferris wheel next to the Waterfront Park. The final design is a 6-foot-high by 6-foot-wide image of rectangles within rectangles. The mirrors move in the breeze and reflect ambient light in an aleatory fashion. As the mirrors move and create multiple reflections, the installation creates an illusion of three-dimensionality for visitors who are relatively close to the work. Nickolus Meisel hung a banner with the text “begin” beneath the pedestrian bridge on Alaskan Way to First Avenue on the southern corner of Marion and Western avenues. The artwork offers the word “begin” to serve as a marking point of the beginning in time that you are passing through this space. Ellen Sollod created a series of 32-inch-wide by 48-inch-high vinyl banners printed with photographs that encourage the act of watching Elliott Bay. The banners will be installed on the western fence on Piers 62/63. 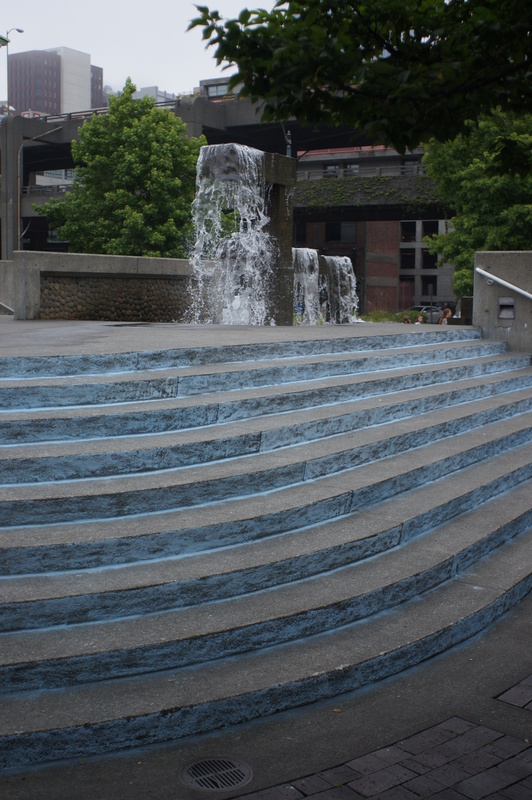 Brian Benfer created a series of vertical chalk rubbings on the curved staircases in Waterfront Park. The stair riser will have color fields that change over time with weather conditions to create a new landscape on the horizontal sections of the staircase. Images: Ingrid Lahti; Untitled; 2012; aluminum, Plexi mirrors and steel. Located at Waterfront Park. Photo by Jason Huff. Brian Benfer, Untitled, 2012, chalk rubbings. Located at Waterfront Park. Photo by Jason Huff.